Located in southeastern France in the foothills of the French Alps, the charming city of Annecy is not only stunning, but a perfect destination for food lovers who love to sample the local cuisine and discover local products. In case you were under the impression that the French Alps were reserved for winter activities alone, that’s not at all the case. In fact, Annecy’s beauty increases dramatically when the flowers bloom and the liveliness and laughter around the lake ramps up with summer fun. ⇒ See our list of top foodie destinations around the world. The city is full of charming cobblestone streets, colorful buildings, and medieval architecture. Everywhere you turn, there is a surprise waiting – down a narrow alley or around a bend of the canal. Annecy has it all. There’s a castle on the hill, an impeccably maintained old town, a sparkling clear lake, fantastic food, and a mountain backdrop like you only expect to see in a fairytale. Annecy is a welcoming and exciting destination all year round. The lake provides respite from the heat in summer. You can rent a motor boat or paddle boat, take a lunch cruise or afternoon boat ride across the lake, or even just cycle around on the bike path. In the winter, there are many world-class ski resorts nearby. The time of year we recommend visiting Annecy is in the spring or fall, however. If you want to discover the best food products and have as much chance as possible to talk to local food purveyors and try local restaurants without long lines to get in, the shoulder seasons are the best time to go. As you stroll around Annecy, you’ll quickly see how Annecy is a food lover’s paradise. The narrow streets of the old city are packed with cheese and charcuterie shops, ice cream stands, bakeries, cafes, and even chocolate shops. You could spend hours browsing around the food shops, sitting at a cafe for a coffee, or stopping for a glass of wine. If you go to Annecy and don’t try one of the famous cheese dishes, you’re really missing out. Dishes like Tartiflette, Fondue Savoyarde, Raclette, Crozets, and Diots should be on your radar as you scan menus and decide what and where to eat. There are many typical restaurants in Annecy where you can get these specialty dishes. Many of them are tourist restaurants, so make sure to set your expectations appropriately. Below are some of our favorite and recommended foodie places to discover in Annecy. We cover all of the delicacies mentioned above, so you know what to eat and drink, and where to find the best! On Tuesday, Friday and Sunday mornings, the streets of Annecy become crowded with activity as both locals and tourists swarm around the fresh produce market between 7am and 1pm. If you’re lucky enough to be visiting on one of these days, you must have a look around the Old City Market. While the Tuesday market is mostly fresh foods, Friday and Saturday add more crafts and textiles into the mix. The market is spread out over several streets in the old part of town. You’ll find all kinds of local food specialties, as well as fruits, vegetables, bread and cheese. The first thing I think of in association with Annecy is cheese. The city is an epicenter of sumptuous French cheese. 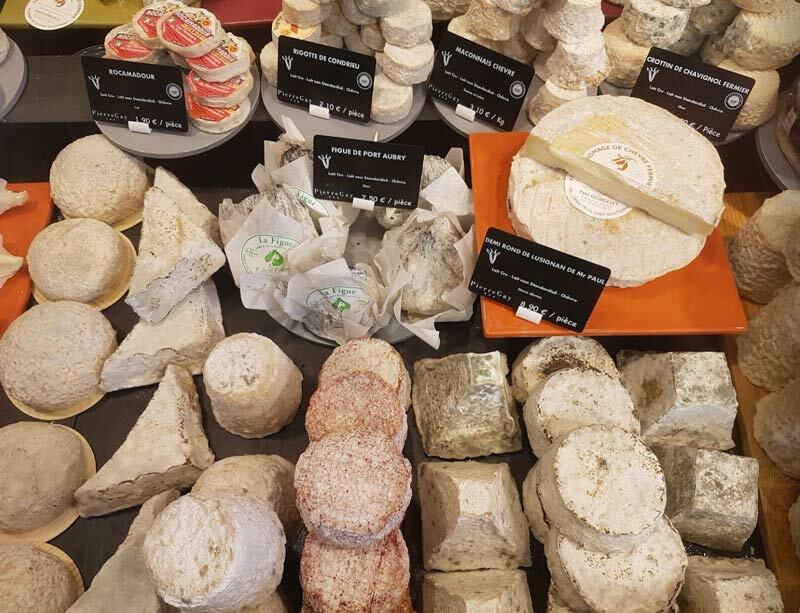 There’s no where better to see the vast array of Savoie and French cheeses than at Fromagerie Pierre Gay. Well known around the area, Pierre Gay won France’s most prestigious craftsmen award in 2011. He is as friendly and welcoming as he is serious about cheese. He and his welcoming staff will make sure you’re well taken care of when you visit the shop on rue Carnot. They will provide expert advice and recommendations so you can discover new favorites. You may be tempted to spend your time admiring the cheeses in the case at the front of the store, but don’t miss the chance to see the cheese aging in the cellar under your feet near the back of the store, where there’s a glass floor offering a peek at the precious wheels of cheese from all over France. Pierre works closely with local producers and distributors to source top quality cheeses that he finishes aging in store. Hours: 8am – 7pm most days, closed Sunday. 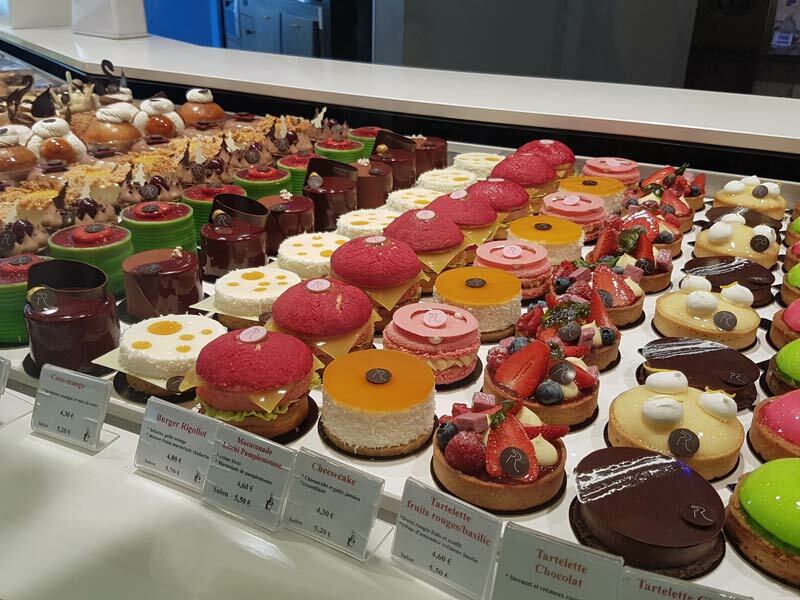 There are many bakeries to choose from in Annecy, but we definitely recommend Boulangerie Rouge, where you can also pick out a few Savoie favorites, like Gâteau de Savoie (a very light and fluffy sponge cake) and Brioche aux Pralines (brioche with red pralines and sugar). There might be a line formed at the door to Boulangerie Rouge because it’s very popular with the locals for the many variations of bread they sell. The line moves quickly though, and you don’t want to miss these specialties of Savoie. Hours: Open 7:30am to 7:30pm, closed Monday. There are some really lovely wines in Savoie, and Le Salon Francais is the perfect place to try a few. Opened last year, this wine bar has rapidly expanded, to the point of combining two storefronts into one to accommodate more wine fans. You can choose your perfect atmosphere from three different seating areas. There are a few outdoor tables, some high tables at the front of the bar, and comfortable couches near the back with soft lighting and warm, rich decor. We love the upside down lamps around the bar. Le Salon Francais has a good selection of wine by the bottle, including a few local Savoie wines, as well as wine from around France. You can also get one or two local wines by the glass. If you’re a bit hungry, they work with the best local purveyors of bread, cheese and charcuterie to offer a selection of small plates. Hours: Open Mon-Sat 6pm to 1am. Closed Sunday. 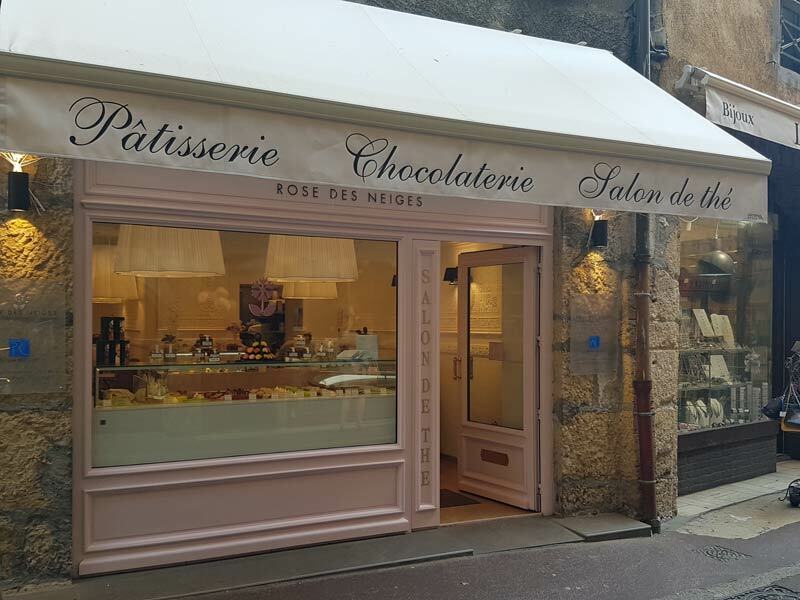 Gourmet pastries and chocolates by Philippe Rigollot can be found on one of the main streets in Annecy at La Rose des Neiges. You can’t miss the bright pink exterior, or the eye-popping delights you can see through the window. 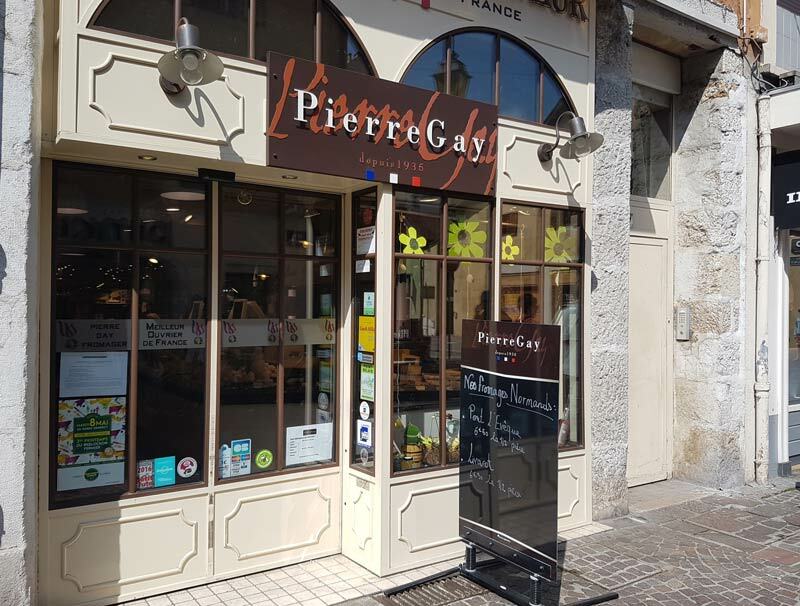 This is Philippe’s second location in Annecy. The other shop is a bit harder to find, as it’s tucked under a building in Place Georges Volland, but you can find even more sugar works of art at that store. Both are well worth the visit if you’ve got an artful sweet tooth. Philippe was featured on the documentary Kings of Pastry where he won the prestigious title of Meilleur Ouvrier de France, France’s most prestigious craftsmen award. Hours: Open Mon to Sun 9:30am to 7pm (Sun til 6pm), closed Wed.
Shop on Georges Volland: Mon-Sat 8am to 7pm, Sun 8am to 1pm, closed Wed.
You can’t walk through the old town of Annecy without discovering at least a dozen or more ice cream shops. We have it on good authority that Le Palais des Glaces (yes, it’s the Ice Palace! ), is one of the very best in town. You may have to queue a bit if it’s warm outside. Everyone wants to try their homemade waffle cones and choose from the many flavors. The ice cream here is made in the traditional way of making Italian gelato, with all natural ingredients, and using the least amount of sugar possible. Hours: Open every day in summer from 11am to midnight, 1am on Saturday. A quick place to grab lunch or a snack is La Fermette. They have a small shop with all kinds of local products, like cheese, salame, liquors and packaged snacks. But the star of the show here is the raclette sandwich, which consists of crunchy French bagette, a few slices jambon, with a lot of gooey, warm raclette cheese spread on top. There’s no where to sit near the shop, so you’ll just take your sandwich to go, and eat it while walking around town. If you like raclette cheese even a little bit, you must stop here! If you’re just walking around Annecy, you won’t stumble upon this restaurant. La Cave a cozy little wine bar located down a small alley, off one of the main roads. It’s a quiet place, set away from the noise and bustle on the street. They don’t have an extensive food menu. Their focus is on the great wine list. But they do have a seasonal menu that pairs well with the wine. 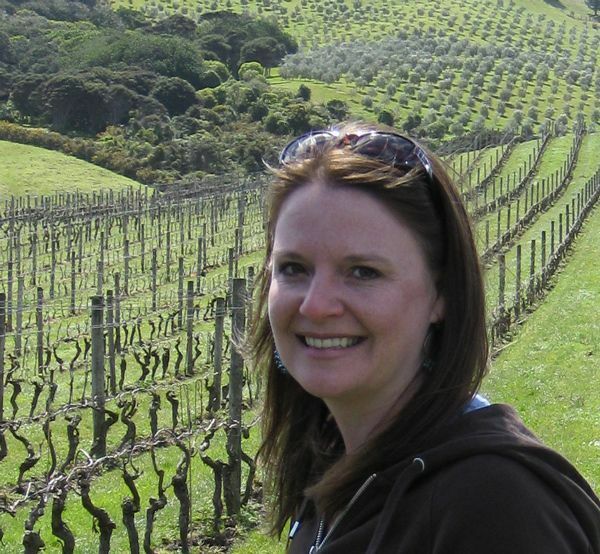 The atmosphere is very pleasant and the staff is very helpful in choosing wine. When the weather is nice, the outdoor patio is the place to be. We ordered the menu of the day for lunch and tried three different glasses of local Savoie wine to go with it. Our meal consisted of an asparagus starter, a fish main dish, a cheese plate, and dessert. The L’Auberge du Père Bise on the eastern shores of Lake Annecy is where owner and restauranteur Jean Suplice creates beautiful plates of food in a magical environment. Suplice was awarded a 2nd star from the Michelin guide in early 2018, less than a year after opening Restaurant Jean Sulpice in 2017 with his wife Magali. The food and the experience certainly do live up to the 2-star rating. If you’re lucky enough to dine outside, you’ll be rewarded with a fantastic view and peaceful, quiet surrounds in which to dine on creative dishes like those you’ll see in the video below. Many of the hotels near the old town in Annecy are small, boutique hotels. You won’t find big chain hotels in this village. There is a hotel or nearby resort to meet every budget and style. Take a look at our suggestions below. The Atipik Hotel Alexandra is a good base for your adventures in Annecy. Its great location right in the center of Annecy, within walking distance of everything you want to see makes it a great place to stay, even if the rooms are small and simple. The rooms are clean and adequate, and there is a nice breakfast room/lounge area where you can begin your morning or grab an apertif. If you’re wanting more space, be sure to ask for one of their larger rooms. And keep in mind that there is no elevator and some rooms are located on the 3rd floor. Located on the eastern shore of Lake Annecy is the impressive L’Auberge du Père Bise, a luxury hotel that is also home to Restaurant Jean Sulpice, which is an experience all on its own (see the video for drool-worthy glimpses of the food). The hotel could not be located in a more spectacular spot. The views are unbelievable. You can even get to the hotel via water taxi from the town of Annecy. Then, once you’re there, all you have to do is relax and enjoy. Pull up a seat next to the water’s edge and soak it all in. Many of the hotels near the old town in Annecy are small, boutique hotels. We know you’re going to love Annecy as much as we did. It’s truly one of the most beautiful towns we’ve ever been to. Aside from it being a great foodie destination, it has a lot of other amazing things going for it. Make sure you plan enough time there to fully enjoy it all! Our trip to Annecy was made in cooperation with Savoie Mont Blanc and Lac Annecy Tourisme. All opinions and recommendations stated in this guide are our own. This entry was posted in Food, Things to do and tagged France. Laura I would get lost in that cheese cellar LOL! Funny; I can go without cheese for months. I do when living in places like Thailand, where good cheese is scarce. I mean, non-existent. But if I visited France I’d go bonkers. As I am doing here in New Zealand. I do not scarff down blocks in a sitting but a little slice daily because Kiwi cheese is out of this world. Edame, blue, all are wonderful. I’ll be honest, Ryan, sometimes I do really want to scarf down a block of cheese. We had some really good cheese in Annecy and surrounds. But alas, a slice or two will do! Where to start in France is always a question for us. “So many bakeries…” and pastry shops, sweet. Sounds like Annecy is a foodies dream destination. And Great photos. I hear you, Lori. For us, it’s always “so much wine!”. Where to start. Ohhh HELP!!! My 23 yr old granddaughter and her bffs from high sch r traveling to Paris Sept 2018. She s asked me to help her plan….omg I am overwhelmed . Thankfully I found your site to help. They ll fly into Paris staying 3 or 4 days with a near Paris visit south back to Paris for trip home seven days start to finish. Having been to Spain twice and England this is their first time to Paris. Hotels or B&Bs . Can u help us!! Sue, never fear, Savored Journeys can help! Best thing for you to do is search our site for Paris. You’ll find a shortcut guide to Paris that gives all our recommendations (places to stay, where to eat, what to do). Paris is actually very easy to get around using the subway, or even by walking. Send us an email if you need more help ([email protected]).